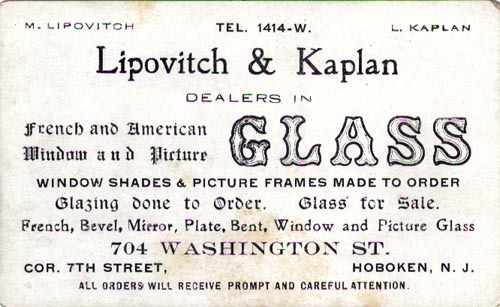 Lipovitch & Kaplan, Dealers in French and American Window and Picture Glass. M. Lipovitch, L. Kaplan, 704 Washington St., Cor. 7th Street, Hoboken, N. J. Are you looking for LIPOVITCH ancestors? If so, we suggest posting a query to our Community Message Board to get assistance from other researchers.